Ham radio will look much different fifty hears from now. How different? The activity of millennial hams today might provide some clues. Recently, I got two very interesting e-mails from ham friends. The first announced that my community has joined the Amateur Radio Emergency Data Network. Basically, AREDN creates local and meshed wireless networks on ham-only frequencies in the 2.4, 3.4 and 5.8 GHz range. Often, hams achieve these networks by re-purposing commercial WiFi equipment. The second e-mail linked to a blog articles that explored the question of whether millennials are killing or reinventing ham radio. An interesting discussion. Millennials are folks born between 1980-1995 or roughly people aged 23-38 today. My reaction to these points of view was mixed. Why would hams want to duplicate the Internet through AREDN? Why not just make more use of the Internet, which is both ubiquitous and reliable in most places? And, why would anyone think the next generation is going to use ham radio in the same way as the previous generations? Everything evolves. And, usually in unpredictable ways. I think the answer lies in the transition ham radio has made from inventing things to creatively using things in different ways. In the early years, ham radio was highly inventive. It was a community of inventors which gradually gave way to a community of users of those inventions. I would be hard pressed to enumerate a strong list of recent ham radio inventions. Some people might point towards weak-signal data modes, APRS or software defined radio as inventions. But they are not. They are creative uses of commercial, scientific or industrial inventions. In some cases, the inventors happened to be hams, such as Joe Taylor recently or Art Collins back in the old days. 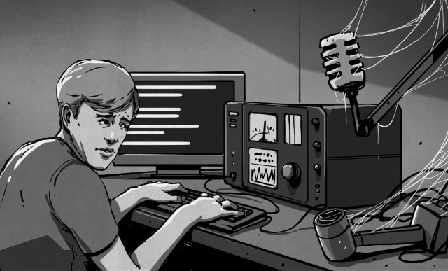 Ham radio has a lot of resources to offer millennials. But, probably, not as an end in itself. I was licensed fiftyyears ago. If I pick up a QST from 1967, I will recognize most of the content as very familiar, both in terms of activities and , to a slightly lesser degree, technologies. I wonder what QST will look like in 2068?